Watts Cheaper 110 or 220 Volts? 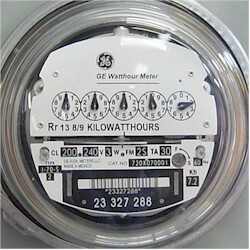 How much will I save on my electric bill if I run my lights on 220 volts? A quick answer: Probably nothing. This is a common misunderstanding about how electricity works and how the power companies charge you for it. The point often noted for the money saving argument is that the amperage is half as much when running grow lights on 220 volts instead of 110 volts. This is true but the utility company doesn't charge you for amperage, they charge you for wattage. They bill you in kilowatt-hour units. A kilowatt-hour is 1000 watts of usage for one hour or approximately equals a 1000 watt light running for one hour. There's a nice formula for this: Wattage / Voltage = Amperage. If we plug in the numbers for a 1000 watt sodium grow light, you can see that although the voltage and amperage can change, the wattage always stays the same. Note that a 1000 watt sodium ballast draws 1100 watts. Right about now is when I get the question "well why do they make stuff to run on 220 volts then?" Usually large machines and appliances that draw lots of power run on 220 volts (or more) mainly because of the size wire you would need to use to run them on 110 volts would be very large. The gauge and length of the wire will determine the maximum amperage it will handle before it melts! On a 220 volt circuit, the load is split between two 110 volt wires. This allows you to run smaller wire. This brings us to the "probably" part of the answer. There is another factor, it's the voltage drop or the voltage lost when the power travels down the wire. The lower the resistance on the wire, the less the voltage drop. If you are running one or two lights in a typical home with the breaker box a short distance away, the efficiency lost due to voltage drop may not be significant enough to justify rewiring your grow room for 220 volts. Calculate your electricity cost to run a grow light. This calculator uses K = 12.9 circular mil ohms per foot for copper or K = 21.2 cicular mil ohms per foot for aluminum. These values assume a conductor operating temperature of 75 degrees C. For other values of K based on conductor temperature use the advanced voltage drop calculator.